Graphic Gin Off Round 4 – Don’t Miss It! 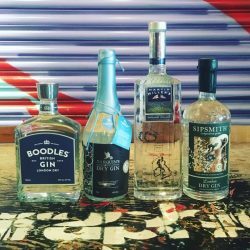 Following a nail-biting last round, London’s biggest gin competition – THE GRAPHIC GIN OFF 2016 – is back on the 18th of July at Graphic Bar in Golden Square. Round 4 will see three gin brands, Boodles, Tarquins, and Sipsmith challenge last year’s winner, Martin Millers, for a coveted place in the quarterfinals. A designated bartender from each team will be tasked to create a cocktail for guests to enjoy! The third round saw Haymans Gin concoct a Tea Party mix with strawberry jam and lavender infused Old Tom Gin, served with its own scone. The winning drink eventually went to French distillers Audemus’ Pink Pepper Gin, Avocado and Basil creation, served in teacups and topped with an edible flower.